Since Michael and I moved to Austin, I have been cooking a lot more. Of all the pots and pans we have in the kitchen (various brands, mostly stainless steel All Clad), my favorite is the Tramontina 12" tri-ply clad saute pan. It not only stands up to the All Clad pans we have but is also most useful due to its size. It's 12" in diameter (without handles) and 3" deep (without lid), ~6 qt in capacity, has a loop (helper handle) in addition to the long handle, and comes with a lid. We use it to saute vegetables, pan fry meats, make pasta sauce, etc.. It heats up evenly and is easy to clean (a little Bar Keeper's Friend does magic). We use it everyday and sometimes I wish we have more than one! Picked it up at Marshall's a few years ago for $39.95 which is a steal, and haven't seen them around since then. Recently I found it on Walmart.com for $69.97 which is still a great deal considering the All Clad 6 qt saute pan with lid is $250! If you have been looking for cookware that performs similar to All Clad at a fraction of the price, give Tramontina tri-ply clad pots and pans a try. 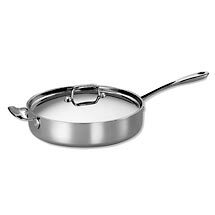 Walmart.com also carries Tramontina tri-ply clad 8"/10"/12" fry pans, 1qt/2qt/3qt/4qt sauce pans, and 5qt/6qt/8qt/12qt stock pots, all at very reasonable prices. Some are available in limited stores, and others are online only (they do offer free site to store shipping). Also available are 10-piece and 8-piece sets. Personally I think the 10-piece set is more useful since the pots and pans are of larger sizes and the set also comes with a 12-qt. covered stock pot. Disclaimer: I'm not affiliated with Tramontina nor Walmart, and I don't get anything for recommending the products. I'm writing about this purely to share information about things that I really like. I've had really good luck with a few of the Calphalon tri-ply pieces. Bed Bath and Beyond has a great glass-lidded 12" "everyday pan." It's got two "D" handles, and a flared lip. The coupons they mail out (almost every week) apply to it, so 20% off isn't uncommon. We have a couple of Calphalon tri-ply sauce pans and they work pretty well. We haven't tried the 12" everyday pan yet but it looks very versatile and the price is competitive ($79.99 at Bed Bath and Beyond minus 20% off coupon in store). The flared rim makes pouring easy. I like the glass lid which allows the cook to see how the food is doing without removing the lid from the pan. At the same time I like the all stainless steel lids from All Clad and Tramontina since (for me) they seem easier to clean - no grove between the glass top and the stainless band that goes around it especially on the inside of the lid where food/sauce may collect. Just a personal preference/pet peeve :). This review stood out as I remember reading Cooks Illustrated review on this pan. They highly recommended it. I guess it's time to test it out.